Please note the following dates are when enrollment will begin: Kindergarten enrollment will begin at 8:00 on Tuesday, February 5. Preschool enrollment will begin at 8:00 on Tuesday, February 12. Please don’t hesitate to call school if you have any questions in that regard. And? Bundle up! It’s beautiful out there! Registration is open for Afterschool Community Enrichment classes! New A.C.E. classes including Volley Kids for grades K – 2 and Mime’s the Word and Painting on Canvas for grades 3 – 6 begin January 31. Register by filling out a registration form and returning it to the Southside or Pine Ridge office by Monday, Jan. 28. We are Moving! Beginning Friday, January 19th, the Moms In Prayer (MIP) group from the Middle School, Pine Ridge and South Side will be meeting at South Side once again. We will promptly begin at 8:20 and go until 9:20as we gather in the library. Please contact Nicole Shook at ncshook@gmail.com if you have any questions. We are looking forward to having you join us. They are almost here! Start thinking of the possibilities for this annual event. It will be fun to see what the kids come up with. Lions, and tigers, and bears – oh my! Save the date for Fun Night! Friday, March 8, 2019 5:30 – 8:00pm at Pine Ridge. There will be many volunteer opportunities available! Come to a TRIP (tuition reduction program) informational meeting! A few years ago the kindergarten teachers from South Side attended a conference on the importance of play and the impact child-led play has on the brain development overall wellness of the whole child. 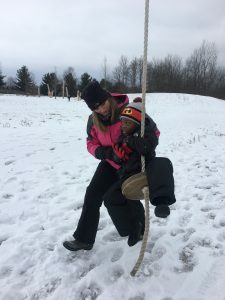 Since this training, Mrs. Becksfort and Mrs. Strikwerda have incorporated more play and free choice opportunities in innovative ways. It’s a joy to observe and hear the students’ excited engagement in the classroom. 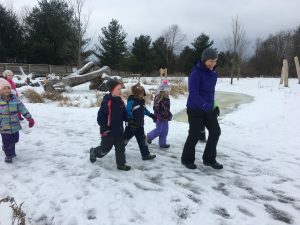 Most recently, Mrs. Becksfort and Mrs. Strikwerda have also been learning more about outdoor play through Mr. Harig and his Forest Kindergarten class. In order to further lean into their learning and out of their desire to meet the needs of all young learners, Mrs. Becksfort and Mrs. Strikwerda’s classes will be regularly heading to the Outdoor Discovery Center for the afternoon on Wednesdays throughout second semester. 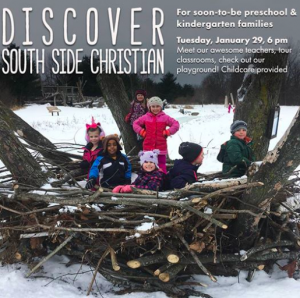 Our kindergarteners will experience learning which incorporates more outdoor play and as well as teacher-led instruction in God’s great outdoors! Thank you to many who have suited up and joined our staff supervising and playing with our children at noon recess! We only have two vacant spots left. If you be willing to please check your calendars to help us from 11:45-12:35? The stipend we offer is $10 for your time. The joy and bonding with the children? Priceless! 🙂 If you have signed up to do classroom lunch supervision for your child’s teacher and could stay the extra time, we’d appreciate your help! Please contact Mrs. Rynsburger at mrynsburger@hollandchristian.org or Mrs. Meiste pmeiste@hollandchristian.org for details. Holland Little League is now registering baseball and softball players for the 2019 season through Saturday, February 9th. More information and the registration link can be found on their website located at www.hollandlittleleague.com. 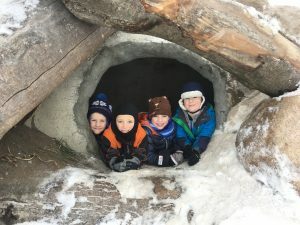 Looking for some mid-winter fun? Bring your family and friends to the CLC Network (previously known as Christian Learning Center) Auction on Saturday, January 26, 2019 at Calvary Christian Reformed Church (3500 Byron Center Ave SW, Wyoming, MI). Dinner and the silent auction start at 4:30pm, and the live auction begins at 6:00pm. Bid on merchandise, gift certificates, experiences, and much more! 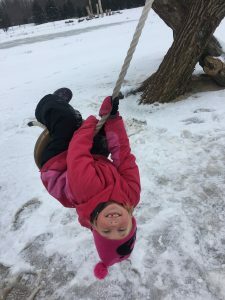 Your participation helps equip congregations and schools to glorify God through purposeful, innovative inclusion of persons with varied abilities. Learn more at clcnetwork.org.